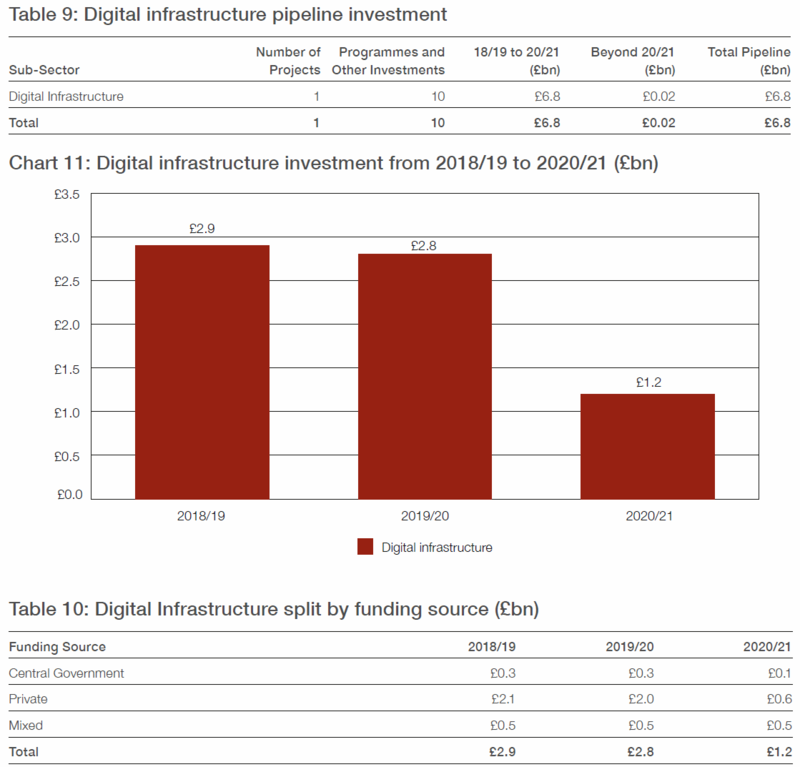 Overall £6.85 billion is currently going toward 11 digital infrastructure projects across the United Kingdom, but broadly speaking this report (PDF) doesn’t tell us anything particularly new (it’s more an overview of known investment so far) and we’ve already given a brief summary as part of our earlier Budget 2018 Report. Nevertheless it’s not often that we get a useful breakdown of funding (public and private) and the related spreadsheet (MS Excel) is particularly helpful in showing how the different funding sources are split between projects, albeit done as a generalised overview. In fact it also offers a summary of pre-2018/19 funding (including older Broadband Delivery UK contracts etc.) but we’ll get to that later. The above totals reflect various on-going projects (only for the 2018/19 to 2020/21 period), such as Virgin Media’s cable expansion, the 700MHz clearance (Ofcom will auction this spectrum band for mobile operators in 2019), BT’s (Openreach) investment, new investments by alternative network ISPs, 4G mobile and related network upgrades, Broadband Delivery UK, the £400m Digital Infrastructure Investment Fund (DIIF) for altnet ISPs, the Local Full Fibre Networks (LFFN) programme, rural full fibre (FTTP) pilots, 5G testbeds and trials and finally Cityfibre’s full fibre investment (supported by Vodafone). NOTE: The report also covers other sectors to 2028, such as Energy and Transport. “We are committed to renewing our infrastructure to drive economic growth in all parts of the United Kingdom. Over the course of this Parliament, investment in economic infrastructure will reach the highest sustained levels in over 40 years. And as the pace of technological change accelerates, we are stepping up our commitment to digital infrastructure, use of data to drive greater productivity and embrace new methods of construction. Governments always have a tendency to think of investment on the timescale of a typical parliamentary term, which for the present one runs until 2022. At the same time we note that most of the private funding that has so far been committed to future broadband and mobile upgrades also covers a similar period. None of this means that the current or a future Government and private operators won’t put more funding into the pot for broadband connectivity, indeed it’s inevitable they will. For example, in order to achieve the aspiration for making “full fibre” (FTTP) broadband available to all by 2033 the Government will almost certainly need to inject several billion of additional state aid to help tackle rural areas, but it’s probably a bit too early for that right now. Meanwhile most of the current 5G and “full fibre” related investments tend to cover early trials and targeted funding to help facilitate future network builds. At this stage most of these are predominantly commercial projects, covering urban areas (e.g. Openreach’s FTTP roll-out to 3 million premises by the end of 2020), rather than broad state aid orientated support for large-scale deployments (like the original BDUK scheme). Finally, the spreadsheet also seems to provide a useful breakdown of total capital expenditure between the different projects which, given the BDUK figure of £1.7bn (public) and Cityfibre’s figure of £2.5bn (private), appears to include both past, present and future investments. We’ve edited together our own summary of this in order to save our readers some time. Added a comment from UK ISP Community Fibre. “Basic Internet access is simply no longer enough. As the majority of the connections in the UK are copper-based, it is evident that the UK is not fully prepared for the digital future. Recent OFCOM research has found that the average household is doubling its data consumption every two years, be it watching online video or accessing government services, and so adequate broadband is swiftly becoming vital. 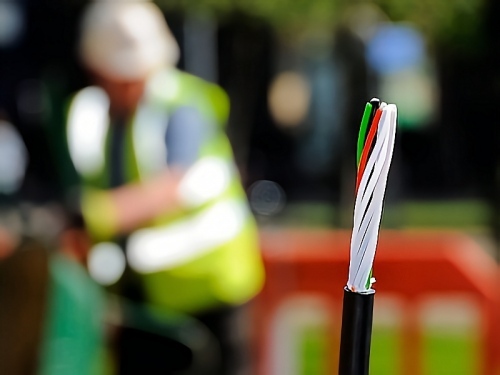 To keep up with these demands, quality true full-fibre broadband must be regarded as an essential utility. 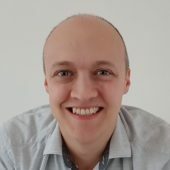 With a greater number of vital services going online and demanding a high-speed connection, strong and decisive action will be required sooner than many anticipate.